Only one day at the show this time. Our van is misbehaving, so we're playing it safe. The original intention was to come home, and reload a bit for the second day. About three blocks from the show, the van started making a disturbing sound. My husband thought perhaps the rear end was going out. Ugh. I told him we should just go back, pack it up, and try to make it home. There wasn't much left in the booth, so it didn't take us long to pack. The people who run the show were very understanding. We headed off, prayed to make it back safely, and we did. Mr. Van is being checked out tomorrow. Experience has taught me that most customers are looking for gift items in December. So, I focused on small items, and they were popular. I sold lots of my Christmas bags, clay tags, pillows, bottle brush trees in knobs, little vintage items, etc. My dresser was the largest piece of furniture I had, and one of the first things to sell. Once it was picked up at the end of the show, I was pretty empty. Hence, the intention to reload. Sorry, I didn't get a chance to take many photos, and that horrible glare I often get from the window was a real pain. I was pretty tired to begin with. I had orders to get out right before the show, I have orders to ship first thing tomorrow, and made-to-order items to make. Maybe it wasn't meant for me to do two days, and my van knew it. I slept long and hard last night, and woke up with many fresh ideas. I'll be focusing on Christmas, Etsy, my house, by appointments, and so on, the rest of the year. I also have a giveaway coming up. So, keep an eye out. See ya soon. Gorgeous stuff - LOVE the dresser!!! Sorry about your van, hope it turns out to be something simple & cheap!! Sorry about your van troubles, Rosemary! Glad you didn't get stranded! 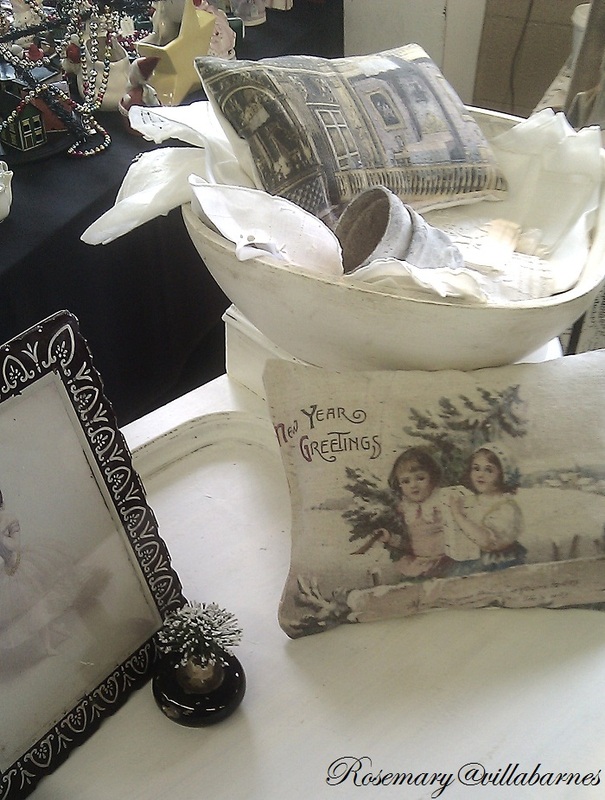 Your booth looked amazing, the dresser is beyond gorgeous! Try and get some well deserved rest if you can!! Rosemary , I am so sorry you are having van difficulties. I am one that believes everything happens for a reason. Maybe you just needed a rest from the show. I hope things go better for you! You make such beautiful stuff. No wonder you sold out so quickly Rosemary... it all looks so beautiful. Hope you get to relax over Christmas. I do believe Mr. Van wanted you to rest a bit! I love the little pillow with the colored graphic on it! Are you going to do any for your Etsy shop? Sounds like the somebody knew you needed some rest. Hope all goes well with the van. I am sorry to learn about the van - just when you need t hem the most. But when things like that strike me I try to remember people who have NO vehicle or work to go to, etc. It keeps things lighter in my heart, esp this crazy and busy time of year. I am super happy to read you were blessed with success at this show -helping you stay and grow the business, yay for you! Couldn't happen to a sweeter lady! 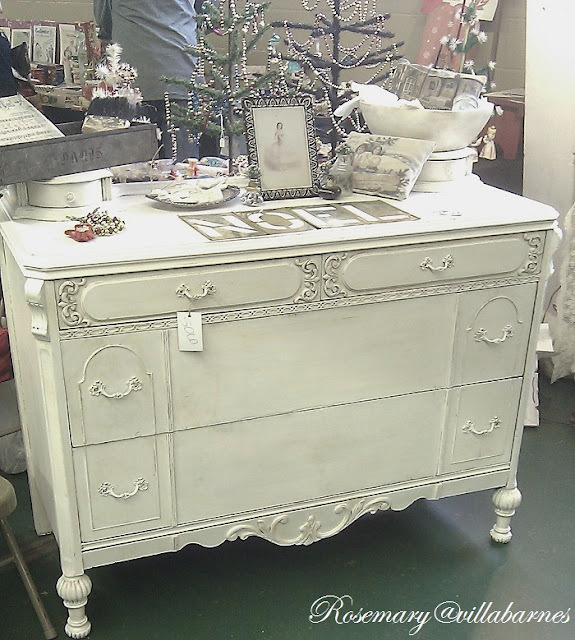 The dresser in the pic - WOW - gorgeous - I know WHY it sold fast!! Sorry to hear about your van.I sort of feel your pain.We had to take our Jeep in for new tires.Not something I wanted to spend money on this time of the year.But not much you can do about it.Plus there are two other home repairs that need attention soon too! I knew that piece would sell fast! It is a beauty! love that dresser. You just do such beautiful work. so glad sale went well, and hope your van is not too sick. I'm so sorry about your van, Rosemary, and I hope that it won't require extensive (and exPensive) repairs. That dresser is beautiful...happy for you it sold fast. Car trouble is the pits. I hope it is going to be okay! That was a beautiful dresser! No wonder it sold first! Sorry about the van...I get so nervous when I have unreliable vehicles~best to get it fixed. And then get the rest you need. It's too bad you missed the second day of the show but, as you say, it may have been all for the best. I guess that's the last of the heavy work for you this year. Yay! Rosemary that dresser is amazing! Is that just a straight white-wash with the white gesso? Lovely things....miss seeing you.....been busy with other shows. I just adore that white dresser that sold!!! Someone is lucky to have that. I also love those little Charlie Brown trees in the background. Cute! Hope your van gets fixed soon and you can get some rest. Glad you made it HOME! - OK*!*! Sad I wasn't able to make it to Kane..
Take care and NOW Enjoy-The-HoLIDAys!*! *!